Oh you have excelled yourself. These are so cute. I think I have to make them. Such fun for a help yourself starter. RG – Yes, and not difficult to make either. Oh simple and riveting, GM! WWW – Have fun with them. 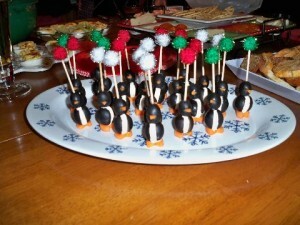 And, Grannymar, well done for giving us penguins to go with the snow and ice outside….brrrr! Sandra – They are tempting. Those are really cute. 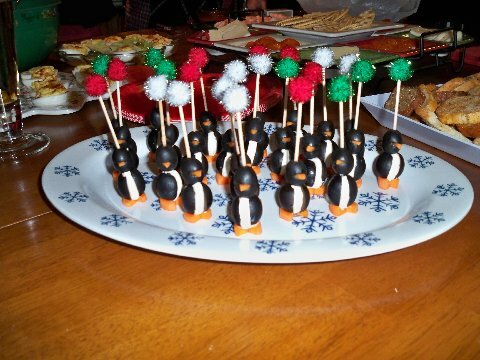 Had some other animal eatables last Christmas. Thought I’d remember how to make them, but I have the Senior Memory syndrome. I’ve been searching for something, “seasonal” to serve at my son’s birthday party, without making it a Christmas party (poor kid, his birthday gets lost in all the festivities otherwise). These are…the cutest thing I’ve ever seen-and perfect for a six year old. Thank you so much for posting this. Mrs ETB – Even better if you get the children to make them! Alice – A thinly sliced ring of carrot is what you need for each penguin. Cut a tiny wedge (like cutting a slice of cake) and use the wedge to form the mouth! Yeh well we all know Nancy’s a sandwich short of a picnic! Hahaha she’s a hoot! Vey cute. If only kids liked olives. Baino – Getting the kids to help make them is one way to encourage them to try new or unusual tastes.